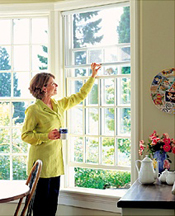 Installing a Serene Window Screen means never diminishing the décor or striking views of your home. From its contoured housing to its ergonomically designed handle, the subtle and sleek Serene is built to ensure smooth operation and superb style. And with our new mesh retention system the Serene screen stays in place, even in breezy conditions. In the case of windows, Phantom's Serene window screen is picture perfect. Stylish, adaptable and suited to the finest homes — like yours — it fits in any room you choose — kitchen, living room, study, bedroom or bath. Open the window, and the Serene screen glides gently into place. Close it, and the Serene rolls silently away. No more unsightly screens blocking your view. 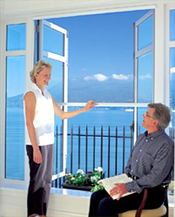 Offering total protection from insects while maintaining the views from inside and out, the Serene window screen is a unique addition to any construction or renovation project. For specification drawings, please go to our Business to Business Information Center. You will be directed to our page with downloadable drawings after providing some brief information about yourself. Slide bar, housing and tracking system made from high quality extruded aluminum. Baked on enamel finish resists fading and chipping. Sturdy, UV resistant nylon handle and fittings. Fiberglass mesh coated with PVC for enhanced durability. Sturdy spring mechanism to retract screen. *Not all mesh types are available in sizes offered. **This is a general color guide only. Actual product colors may vary, depending on your computer screen or printer. Your local distributor can provide actual color samples.